Takuya Sakamoto from Loop Magazine and I shared a phone conversation about two months ago that has now transpired into my words and photographs being published in Volume 23 of the mag. It's so cool to see my photos surrounded by Japanese characters and by many pages filled with stories about the bike culture in Tokyo! Because my story was only published in Japanese, I'm sharing it in English here along with photos and captions. Initially I signed up for the Baja Divide as a personal challenge; I had my heart set on completing the entire route. The adventure quickly turned from being about myself to being about the people I was with. I wasn’t expecting to create strong, lasting relationships on the Baja Divide, but I’ve walked away with a couple handfuls of really great adventure pals. I can’t wait to see what the road has in store for us next. Wild camping is prime along the Baja Divide. Every evening just before dark, we would start hunting for flat ground concealed from the road by boulders or large cacti. Usually the only danger we worried about was scorpions. Every night we would work together to build a big campfire and enjoy dinner and tequila under the stars. If you have a passion for bicycles and want to slow yourself down to experience both culture and landscape, there is no better means than bikepacking. Bikes are universally recognized as transportation, recreation, creativity, and fun—even in remote towns that rarely see visitors, being on a bike makes you approachable and interesting. They allow you to travel at any pace you wish, over nearly any type of terrain, all while being fully immersed in the surroundings. A car doesn’t let you gasp with every meter of mountain climbed or feel the rush of joy as you crest the top, the wind knocking tears from your eyes as you speed down the other side. It is for these reasons that I was drawn to bikepacking. On January 2, 2017, I rode my new fully loaded touring mountain bike to the San Diego waterfront to meet the hundred other bike nerds who’d signed up to start the Baja Divide together. The route had been finalized a couple months prior and the creators, Lael Wilcox and Nicholas Carman, wanted the first season of the Baja Divide to be successful and generate momentum for more riders in the future. When I reached the waterfront, I looked around at all the new and familiar faces in awe of the bikepacking history we were making. I was surrounded by some of the most influential adventure cyclists of our time. There had never been an international bikepacking event quite like this. Not only were we delighting ourselves with rugged adventure, we were also supporting local economies and attempting to break down a barrier strengthened by the recent election of Donald Trump as the president of the United States. Tensions between the US and Mexico were as high as the wall he threatened to build, and our goal was to #buildroutesnotwalls. The terrain of the Baja Divide is very diverse, as you might imagine for a 2735-km route. We rode on rocky and sandy beaches, gnarly loose mountain descents, and endless washed out dirt roads. At first, riding a fully loaded mountain bike felt a lot like pedaling an overstuffed armchair. It took a little while to get used to the weight, but eventually I felt more agile riding this bike than any other I'd ever had. This bike became my home! At times I’d have to carry 14 liters of water into the desert. With an aluminum bike, I had a downtube mount fashioned out of rack hardware to carry a 2 liter canteen, along with canteens on each side of my suspension fork and water bladders stuffed in the bags on my bike. Food was stored in my frame bag and occasionally in my backpack when necessary. Clothes, sleeping gear, and everything else was divided between my handlebars and seat post pack. After a few days of riding southward, the mass start naturally dissolved into smaller groups with varied paces and it didn’t take very long for me to foster strong friendships. After all, mostly everyone there had similar priorities and aspirations: to shred dirt and soak up Mexico. And everyone was so rad! A special bond is formed between people who share the highest highs and the lowest lows in the backcountry. At times, we relied on each other to survive—other times, we relied on each other to sing backup karaoke and buy the next beer. Among the typical bikepacking rigs (like mine) were much more unconventional bikes and gear solutions. My pal Adam rode barefoot most days on a vintage mountain bike carrying most of his gear in a milk crate secured to a Clydesdale cargo fork from Crust Bikes. When we would emerge from the backcountry and roll into a small town, locals would smile and wave with a curious look in their eyes. Most times they’d exclaim about how large our tires were or how “loco” we were to be riding bikes through the desert. They would ask where we were headed and we would respond, “Cabo,” watching their eyes widen. In many cases, locals would offer us food or a yard to sleep for the night. One of my favorite parts of bikepacking is the constant generosity shown by strangers along the way. Once, we needed to cross a large bay to reach a remote peninsula called Los Hornitos to continue riding on route. We paid a fisherman a small amount of money to load our bikes and ourselves into his small panga and we held on for life as we jerked up and down ripping across the waves. My friend Tang named the many seabirds we sped by and I couldn’t wipe the open-mouthed grin from my face. I never expected to be sitting on a beach with six unique individuals and six bikes, all teaching each other what we know about the world as we looked across the water at the few specks of light on the other shoreline. I told myself I wanted to do this for the rest of my life. Between mechanical issues, sickness, and poor road conditions, hitchhiking is nearly inescapable on this route—like many other long bikepacking adventures. Luckily, in Mexico many people drive pickup trucks and are eager to help stranded cyclists. Bikepacking connects me with the natural world and with myself more than any other activity. Removing myself from the bustle and grind of the city and reducing my needs to minimal necessities creates a peaceful mindset. Because you never know exactly what will happen in a day, you must take it all as it comes—not worrying about much other than what oceanside cliff on which you’ll sleep that night. Sometimes you’re forced to navigate bad weather or sew a torn tire, but it never seems unconquerable surrounded by helpful, skilled friends. 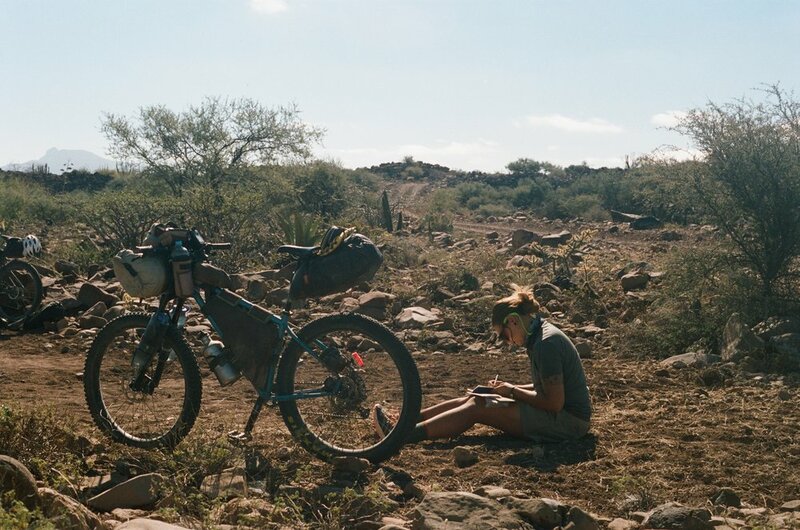 The Baja Divide taught me that I have a growing hunger for bicycle adventure and it doesn’t have to stop now that I’m back home in Austin, Texas. Powered by an interest in sharing my passion with others, I have been leading a weekly bike camping clinic to teach people in my community how to fit small overnighters into their busy schedules. Bikepacking and bike camping can be both big, ambitious undertakings as well as a quick way to skip off into nature for the night to relax. The best part is that anyone can do it—all you really need is a bike and a sleeping bag. I fell in love with minimal bicycle adventure in 2015 and took on my first bike tour with Scott Machen and Johnny Alcantara on the Oregon Outback the following year. Initially a road cyclist and city commuter in Austin, Texas, I dove head first into the world of adventure cycling with the Baja Divide in January 2017. I’m hooked! I am a graphic designer and amateur film photographer; soon I will be living on my bicycle and working remotely full time. After riding through Alaska this summer, I plan to spend the next year in Australia and then ride the length of South America from Colombia to Patagonia, continuing to take photos and write along the way (but let's be honest, I'm going where the wind blows me).